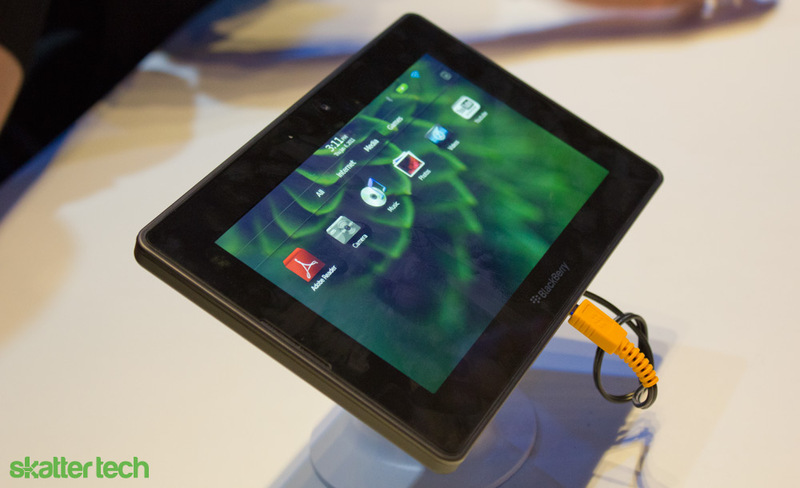 Although CES 2011 was filled with one tablet after another, one our favorites was the BlackBerry PlayBook. RIM and Sprint announced plans to launch a 4G iteration of the PlayBook at the conference. While the majority of tablets on the show floor ran on Android, the PlayBook features RIM’s new operating system and has some hardware that will impress just about anyone. For those unfamiliar with the BlackBerry PlayBook tablet, it features a 7 inch multi-touch LCD screen, a 1 GHz dual-core processor, 1 GB of RAM, an HTML 5 compatible browser with Adobe Flash support, WiFi a/b/g/n, Bluetooth 2.1, a micro USB connector, and micro HDMI output. Although labeled a “professional-grade” tablet for business users, it also includes a 3 megapixel front-facing camera for video chat and a 5 megapixel rear-facing camera for great photos and HD video. And unlike the Apple iPad, it even offers a set of stereo speakers for optimal audio quality. “RIM believes a significant portion of the tablet market will want a higher performing, multitasking, professional-grade tablet and that is why we chose to design the BlackBerry PlayBook for premium performance with a powerful dual-core processor and multitasking OS. Together with Sprint, we are now building on that performance advantage with 4G and providing an unparalleled mobile experience for users,” – Mike Lazaridis, President and Co-CEO at Research In Motion. For those wondering, the PlayBook doesn’t use the traditional BlackBerry 6 OS that’s featured on devices such as the Torch. RIM started fresh with an entirely new operating system entitled BlackBerry Tablet OS. While RIM has clearly spent time on providing a quality entertainment and multimedia experience, they are not taking any steps backwards when it comes to getting real work done. The PlayBook offers one of the best tablet multi-tasking experience, some excellent security features, and full support for enterprise users. While most details about the BlackBerry PlayBook are widely available, such as the exclusive summer launch with Sprint, pricing is still a mystery. However, last year in an interview with Bloomberg Businessweek, Jim Balsillie, the Co-CEO of RIM stated that the device would sell for under $500. As for the PlayBook, I was quite impressed after getting a chance to try it out. The hardware was quite robust and it felt like a premium product. The software was absolutely refreshing and the interface was very responsive. While the network was quite slow in the Las Vegas Convention Center, I’m sure that PlayBook will blaze through web pages on a normal home WiFi network or Sprint’s 4G broadband. As it’s an entirely new OS, it’s likely that it will take time for quality applications to become available for the platform. It could somewhat impede immediate adoption by some users. We will absolutely get our hands on a unit for a full in-depth review closer to launch. So stay tuned for more details. Feel free to subscribe to Skatter Tech to keep updated.